If you’ve ever wondered how to remove scratches from bathtub siding without ruining your tub even more, then this article is for you. Scratches can turn your beautiful tub into an unsightly one quickly. Unfortunately, getting a scratch on your tub is usually much easier than removing one, especially when you’re installing a new tub and got some accidental bumps and scrapes on it along the way. 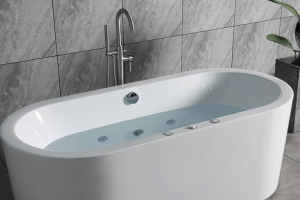 This guide will explain how to fix bathtub scratches in the most common types of tubs – acrylic, fiberglass, and porcelain – so that you have a helpful reference available, should it happen to your tub. Scratches on your acrylic tub most often happen when you attempt to clean your bathtub. If you aren’t sure what material your tub is, then you might grab a scouring pad or hard-bristled brush and, without thinking much of it, start scrubbing away. Acrylic, unfortunately, doesn’t stand up well to scouring pads and other abrasive cleaning materials, especially when it’s an older acrylic surface with a lot of wear and tear. Use warm water to rinse the tub and remove any soap suds or grime from inside. If necessary, use a mild soap and a cloth to wash the inside of the tub before attempting to remove any scratches. After cleaning, rinse the tub thoroughly and allow it to dry, or wipe it down with a soft cloth until it’s dry. Fill a gallon bucket with warm water about halfway. Add a small amount of a gentle cleaner, like a mild laundry or dish detergent, to the bucket. Your bucket shouldn’t be sudsy but should only have just enough soap to cleanse the scratches gently. Grab a soft towel without any abrasives and soak it in the bucket. Using the wet towel, wipe down the areas of the tub with scratches. You should carefully wipe the scratches directly to clean any build-up from the surface. Also, clean around the areas of the scratches, as these areas are where you’ll also be buffing the tub to restore its shine. Once again, dry the areas where you cleaned and the rest of the tub, if necessary, using a dry, non-abrasive towel or cloth. Use gentle pressure and a blotting motion to dry the scratched areas to prevent further damage or chipping. If the scratches are deep within the surface of your tub, you may need to use fine sandpaper to smooth them out. Use at least a 200-grit sandpaper to avoid gouging your bathtub and creating more damage. Use small, circular motions to sandpaper the scratches gently and smooth the surface. If you’re not sure if you need sandpaper for your scratches, try to buff and polish the scratched area first, as explained in the next step, before attempting sandpaper. Some scratches will lift from buffing and polishing alone. Use a liquid polish made for acrylic surfaces to polish the scratched areas. Apply it to a wet cloth and rub the polish on in small, circular motions until you see the scratches fade away. Then, rinse the tub and use a clean cloth to remove any polish residue from buffing. Dry the bathtub with a dry towel. Learning how to remove scratches from fiberglass tub surfaces is similar to the acrylic method, but it is also a bit more challenging. You can always try to remove the scratches yourself, but if at any time you think the scratches may be a bit too deep for you to tackle, you may want to enlist the help of a professional refinisher to prevent further damage to your tub. Full up a gallon bucket with warm water and a mild cleaner, like dish detergent or laundry soap. Use a clean, soft cloth soaked in the water and soap mixture to give your tub a thorough cleaning. 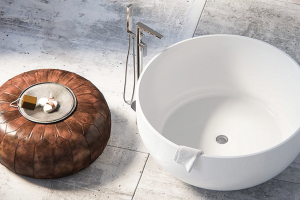 Be careful not to use anything abrasive to clean your tub, as it can create more scratches and chip away at the scratches already on the surface. Dry the tub thoroughly by allowing it to air-dry or by using a clean cloth to dry it. Add a small amount of petroleum jelly to a microfiber towel. In small, circular motions, buff the petroleum jelly gently into the scratched areas of the tub. Continue this motion until you see the scratches lift from the surface. Deeper scratches will need a liquid polishing compound that’s safe to use on fiberglass surfaces. This type of compound can restore smoothness to the surface and help lift more stubborn scratches away. Use the same motion to apply the compound to the scratched areas with a clean, soft towel, and do so until the scratches become less visible. The worst scratches may benefit from fine grit sandpaper (200-grit or higher) to smooth the scratched surface. Sand the scratched areas and use your nail to check the depth of the scratches. If you can still fit your nail tip inside the scratch, you can sand a bit more until the surface feels smooth. Then, buff the area with your polishing compound to restore the surface shine. Rinse the tub with the shower head or by wiping it down with a clean, wet cloth. Allow it to air-dry or dry it with a soft towel. Check the scratched areas and repeat these steps, if necessary, to further remove the scratches. 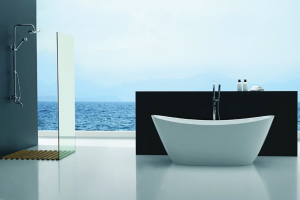 Now that you know how to remove scratches from bathtub surfaces made from fiberglass and acrylic, it’s time to learn how to remove scratches from porcelain tub surfaces, another standard material for the tub. Porcelain is a more durable material than others, so it can typically stand up to more wear and tear than bathtubs made from other materials. Since porcelain is also used in several other bathroom fixtures, like sinks and toilets, there are several tried-and-true methods and products that can help remove scratches in porcelain. 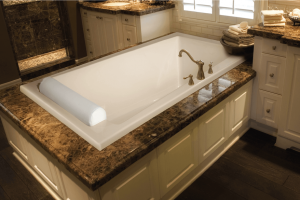 Bleaching your tub can sometimes remove light scratches without you needing to do any scrubbing. You can fill your tub with warm water and add about a cup of bleach per gallon of water. Stir the water and bleach with a gloved hand and allow it to sit overnight. Alternatively, you can mix a solution of warm water and bleach in a bucket and apply the solution to the scratched areas using a towel. Leave it on the tub to soak overnight and rinse with warm water in the morning. Sprinkle baking soda onto the tub’s scratches. You may need to sprinkle the baking soda into your hand first and then pat it on the scratches if they’re on the side of the tub. Use a soft towel to buff the scratches with the baking soda until they aren’t as visible. Rinse off the baking soda with warm water and allow the tub to dry. A pasty white toothpaste can penetrate deep scratches and act as a filler, rendering them unnoticeable. Clean the bathtub before applying the toothpaste. Rub toothpaste over the scratches using small, circular motions. You can apply it with your fingers, a clean towel, or an unused toothbrush. Allow the paste to dry and sand the area using fine-grit sandpaper if necessary. Apply a coat of urethane to keep the area shiny and protected. For very minor scratches, a pumice stone can work wonders on porcelain. Fill up your tub with a few inches of warm water. Soak the stone in the water until it’s saturated. Gently buff the scratches using slight pressure on the stone in a small, circular motion. Rinse the area with warm water and allow it to dry. 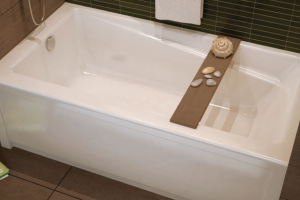 Depending on your tub’s material, the process for fixing bathtub scratches will be a slightly different process. Be sure always to use clean, soft towels to dry the tub and wipe down the scratched surface. Avoid using abrasive cleaners and towels on the scratched area, which could lead to further damage. Use small, circular motions when buffing to allow the product to penetrate the scratch and polish the area. Now you know how to remove scratches from bathtub surfaces made from acrylic, porcelain, and fiberglass. It’s a good idea to check with your manufacturer for instructions to remove deep scratches, or hire a professional with experience in bathtub refinishing to do the job for you.